For 125 years, this hardworking household cleanser has been keeping America’s kitchens and baths sparkly clean—without harsh chemicals or dyes. I bought my first can of Bon Ami powder cleanser when I moved to New York City two decades ago. I’d just rented a studio apartment and wanted to give it a good clean, but I didn’t want to use chlorine bleach or toxic chemicals to get the job done. Up until that point, I’d been mixing my own vinegar-based cleaning products, but my new digs called for something stronger to get through the thick layers of accumulated grime left by the previous tenant. 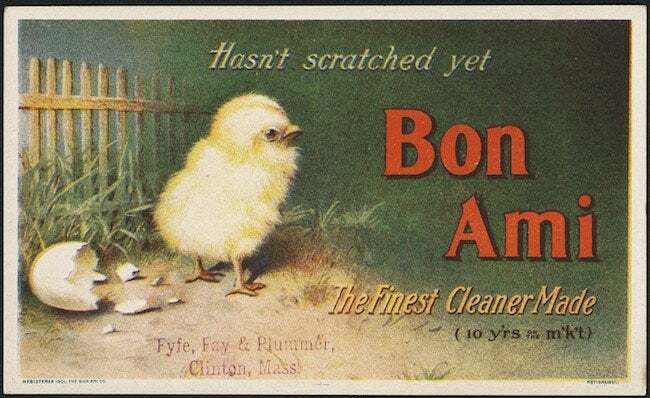 The man at the hardware store suggested Bon Ami when I vetoed some harsher brands, and my enduring relationship with a cleaning product was born. It took a little elbow grease, but the powder lifted the greasy gunk off the ancient stovetop, and erased the stubborn soap scum on my chippy claw-foot tub, all without leaving a gritty residue. And best of all, the powdery powerhouse was cheap and worked way better than my earlier eco-friendly concoctions. As I’ve come to find out, Bon Ami’s fans go way back. In fact, 2011 marks the family-owned company’s 125th year in business. “A lot has changed over the years. Bon Ami’s weathered the Depression, the chemical revolution, and endless fads, but our commitment to products that are effective, ecological, and affordable has remained a constant,” says Carolyn Beaham West, a fifth-generation family member and spokesperson for the brand. Indeed, a 14-ounce can of their workhorse scrub still costs less than a buck in supermarkets and hardware stores. And the cleanser’s formulation—coconut and corn oils, a little bit of baking soda, a touch of soda ash, and gentle abrasives like limestone and feldspar, a waste product of quartz mining that would otherwise go to the landfill—remains as pure and simple as when it was first develop in 1886. To meet growing demand for its earth-friendly products, the Missouri-based Bon Ami recently expanded its line to include dish soap, all-purpose cleaner (good for everything from floors and walls to vinyl car seats), and a liquid cleanser that’s easier to apply to vertical surfaces like shower stalls and bathroom walls, where soap residue and hard-water deposits can be a problem. Packaged in bottles made from 100 percent post-consumer recycled plastic, the new cleaners are also free of phosphates and chlorine. Plus they boast a fresh tangerine-thyme scent that’s derived from essential oils, not artificial fragrances—a boon for anyone with chemical sensitivities. As my relationship with Bon Ami has matured—and my address has improved— I’ve come to rely on the inexpensive cleanser for a lot more than cleaning tubs, sinks, and countertops. I’ve used it to scrub the oxidation from metal fireplace tools scored at an antiques fair, to give my stainless pots and pans like-new sparkle, and to spruce up crusty outdoor grills and plastic patio furniture. I’ve even been told the powder makes a pretty good silver polish when mixed into a paste with water. I’ll let you know how it works if I ever get around to shining up my great-grandmother’s sterling tea set. To learn more, visit Bon Ami.